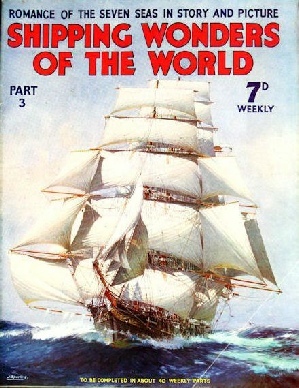 Part 3 of Shipping Wonders of the World was published on Thursday 27th February 1936. [date from rear cover of issue 3]. It was a standard issue of 32 pages. It included a centre photogravure supplement featuring some “Signposts of the Sea”, and formed part of an article of the same title. This week’s cover is a magnificent impression of the famous windjammer Lightning, built by Donald McKay for the Black Ball Line. Reproduced by the kind permission of the Blue Peter Publications Ltd., the original picture was the work of that great sea-lover, the late J. Spurling. This cover was later reproduced as the colour plate in part 10. A first-hand account of an intrepid voyage of 12,000 miles from England to Tahiti, across the Atlantic and pacific oceans in a small 38-ft. yacht with a freeboard of only 20 inches at the stern. The article was written by Sidney Howard and appears to be the first in the series on Great Voyages in Little Ships. The article concludes in part 4. The third of the four illustrations in the photogravure supplement is shown left. In the Hebrides. The lighthouse on the Dubh Artach Rocks, in the Sound of Coll and Tiree, is often unapproachable for days in stormy weather. This photograph shows the relief of a lighthouse man who had been injured. The tower has a broad red band, is equipped with a group-flashing light, and shows two quickly successive flashes every thirty seconds. Visibility is 18 miles. This British Pathe newsreel clip covers the rescue of a sick lighthouse man from Eddystone Lighthouse (1938). Built at a cost of £8,000,000, and a magnificent contribution to ocean-liner travel, the electrically-driven Normandie represents the peak of French maritime achievement. The article was written by A C Hardy. This is the second in the series The World’s Largest Ships. The lighthouse, whether built on a lonely, wave-swept rock, perched on a high cliff, straddling the sands on high stilts, or surmounting a steel caisson sunk into the sand, is still - despite the great development of wireless telegraphy - the supreme beacon for every ship. The article is by Sidney Howard. 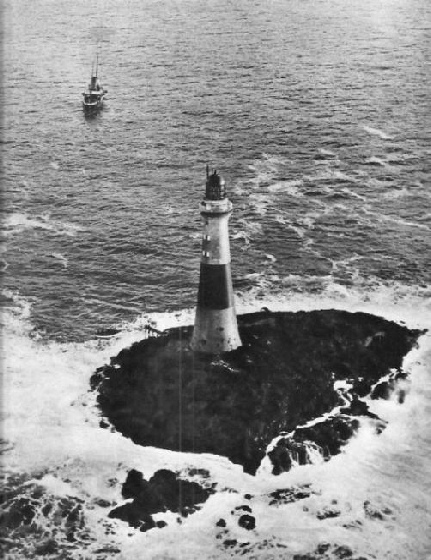 The Eddystone lighthouse (right) is built on a rock in the English Channel, 14 miles south-west of Plymouth. The present tower is the fourth, and cost nearly £60,000. To the right is the base of an earlier tower. The existing structure has two lights; the main light is 133 ft above high water,and is a white double -flashing light showing two successive flashes of one second divided by an eclipse of 5½ seconds and followed by an eclipse of 22½ seconds. Visibility is 17 miles. 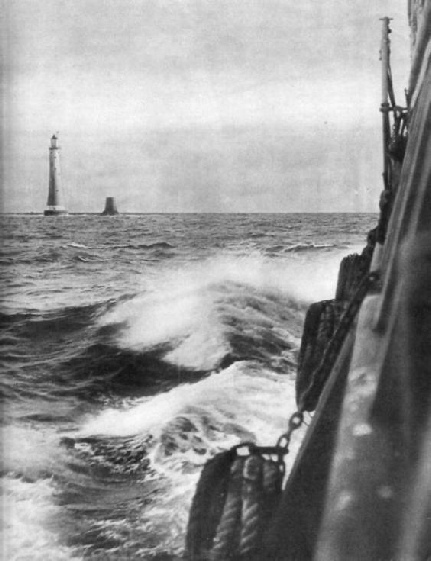 The subsidiary light, fixed white and visible 15 miles, is shown from a window 40 feet below the main light to mark rocks known as the Hands Deep, 3¼ miles NW. 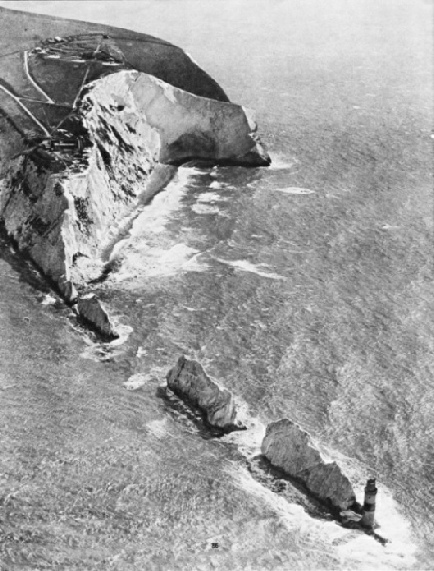 THE NEEDLES, dangerous rocks on the west coast of the Isle of Wight, are protected by a lighthouse, group-occulting, white, red and green every twenty seconds. The visibility is fourteen miles. The tower shows two eclipses of two seconds each; the light between eclipses is two seconds and between groups fourteen seconds. Group-occulting means a steady light, with a group of two or more eclipses at regular intervals. In peace or war, by day or night, the Navy works unceasingly. As the guardian of the world’s most widespread Empire, its diverse activities and responsibilities are unique. The article is by Hector C. Bywater and is the first in a series of articles on The Navy Goes to Work. THIS is one of an increasingly numerous class of vessel constructed in recent years for all long haul routes. She has several interesting points; in particular, high power arranged on a single screw, and a special hull-form with a curiously raking bow. The Nora Maersk belongs to a fleet of twenty-eight steamers and sixteen motor-ships under the control of a well-known Danish shipowner, Mr. A. P. Moller. Completed in September, 1934, she has a deadweight tonnage of 9,300, and a gross tonnage of 8,225. This is the second article in the series on Merchant Ship Types. Newsreel clips from the British Pathe website. The first is of the launching of the Normandie in 1932. The Normandie’s maiden voyage in 1935.